I wish I knew the story behind some of the items I pick up, you can tell it was hand made piece by piece. Although it was in good study shape it did need an update of some sort. Pieces like this you can't just make completely modern and pretend it was never a very old rustic piece. I decided to strip and stain the top and paint the base. Although I usually do not distress most of my pieces, sometimes a piece just needs it to keep with the look. Instead of putting a coat of poly over the top, I used a natural wax to seal and buff it out. I have in my "for sale" page if you would like more information. My kids AWESOME gingerbread houses! I wanted to share an easy way to fancy up your simple drapery. I have used this trick on many of the drapes in my current and past homes and have always loved it. Here is an example of the last set I did... this is my son's room. I had originally hung plain pocket panels that I bought at target over a year ago. Not bad, but kind of boring. Here are the supplies you will need...I usually get mine at Hobby Lobby, but I know Joann's and any fabric store will have them too. You will need Pinch Pleated "stuff" material, pleater hooks and rings. Make sure the rings will fit the rod you plan to use. First thing you will want to do is sew the PP trim to the top of the drapes, making sure that not only the right side, the side with the "pockets" is up, but that the pockets are on the bottom so that the hooks can slide up into them. Sounds like a no brainer, I know...but I have accidentally sewn it perfectly...with the pockets on the top!! One seam on the dotted lined at the top and the bottom. Now just start adding the hooks. The bag of hooks I choose have 4 prongs per hook. This bag also comes with a couple of single prongs. These are good to start and finish with. But you don't HAVE to. Example I use...start with the very first pocket, add single prong. at the end, add another single prong hook they provide. Before inserting the hooks, add the rings and pinch them tight with a pair of plyers. Helps make putting them on the rod SOOOO much easier! In my den. This was actually a table cloth that I loved the pattern of and added the PP trim added to top. I love mercury glass and the vintage look of an antique mirror, how the backing naturally etches off in places over the years. I know there is a way to take a perfectly fine mirror look antiqued as well, this involved a particular acid, something I would like to try in the future. Meanwhile, here is a very simple tutorial on how to create this look with a product call Looking Glass by Krylon. I have always wanted to do this project and thought it would be perfect when I was refishing a hutch and needed somehthing a little different. I am fortunate that I have this nice built in hutch in my dining room, but instead of an area to display all my fine china (right:)), what I really needed was a place to store extra items...girls crafts, my sewing machine and misc. items. Yes, I know I have the whole base for that "stuff", but I need MORE room!!!! And these were basically items I did NOT want to be able to see. Down to my spray booth. Making sure the glass is very clean, you want to do 4-6 light coats, this spray comes out VERY thin and you will need many coats. After letting it dry for a bit, I prepared a squirt bottle with 1/2 vinegar and 1/2 water. The vinegar is the acidic agent that "eats" away at the paint. Working in small sections, lightly spray a bit on the dry glass. Let sit for a few seconds. With a soft cloth, GENTLY tap and LIGHTLY rub. Take a minute to figure out how hard you have to press with the rag to lift some of the spray paint. You may have to go back and add more paint if you take off more than you want, but no biggie... unless you have to make another trip to Hobby Lobby, which is the only place I could find this paint. Also, Maybe look a picture or two of some antiqued mirrors for inspiration, but I just pretty much randomly squirted and rubbed. I really like how it turned out!! The reflection of the "mirror" keeps it feeling open and actually a little brighter. And you can't see my mess behind the doors. Here is a quick tip on how I best acheived the "mercury glass" finish. Using the same supplies, spray a VERY, VERY, VERY light mist of the vinegar/water mixture. If you squirt too heavy, it will just make all the paint run and not adhere to the glass. After a light mist, start spraying the Looking Glass Paint. It will run, you will have to do many coats too. I kind of moved the jar around to help the mercury glass droplets go what I wanted it to as it rolled down. layer on the paint until you have the look you would like. Here is another fun before and after (fun for me anyway)! I have so many neat pieces sitting around that I have collected over time, I really need to get pictures on my site to let people see what I have and choose their own color. I know black, brown and white are very popular "go to" colors but I truly think that a strong color, like a deep shade of grey can be just as neutral and timeless. I'm really into gold lately and think it's making a comeback of sort. I'm not saying I am going to change out all of my door hardware or bathroom and lighting fixtures, but for some vintage dressers and furniture pieces, I think it's classic and beautiful. I prefer to keep the hardware "as is" on most pieces, but these were just not very pretty and after a good scrubbing, looked even worse...so I sprayed them. I have a very thorough and precise process that I go use when painting hardware, they will last forever! The below picture looks more "blue" but it is really more dark grey. So awesome! Hello! 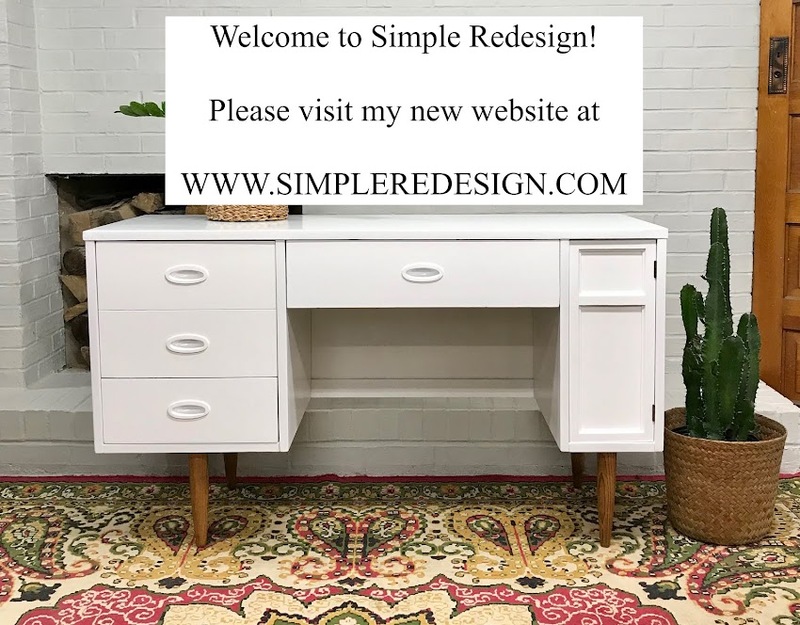 I do have a couple of good DIY's up my sleeve, but in the meantime, I thought I would do a quick post about this secretary update. I LOVE me a good before and after!!! Instead, I decided to use some cork board I had left from another project and cover it in some fabric, which was actually a curtain I found at Target. I used spray adhesive to attach the fabric. This is a pretty strong adhesive but not so strong that it will ruin anything if and when you decide to remove it. The cork was actually cut real tight and only need to be pushed into place, no tacking needed. I love the spot for a small computer or cell phones to hide cords. I wanted to keep this thing so bad! But could not find a spot for it. I wish I could keep everything I painted! I am not exactly sure what I saw in this big box of a cabinet, but thought it had potential for me to get creative and add some interesting detail on the plain front doors. It sat in my office (garage:)) after being sanded for a few weeks before I decided what to do with it. I have been loving the greek key design for a while and thought it might look interesting added to the front somehow. Naturally, I forgot to take picture of this process, but what I did was tape out what I thought would be a good size on the front door, measured and jotted down my dimensions on paper. After a trip to Lowe's for the wood, I cut to the dimensions and mitered the corners. I primed and painted the pieces before I attached them with my nail gun. I really think I could have just gotten away with just using wood glue, but was planning to actually use these pieces as the hardware, so knowing they would get pulled on, added some nails. I love how it turned out! I really like the gold/champagne color with the blue green. Have you ever found a piece that you really like, but not to sure about the inlay? Don't overlook it! You can easily cover it up with a few coats of wood filler. 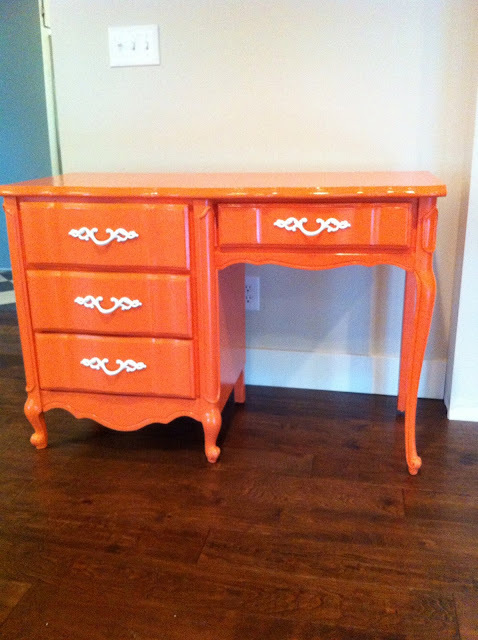 Here is an example a 2 pieces were the clients were looking for a very modern look on a very "girly" design and I knew the inlay was not going to go with the look they were going for. I only took a picture of the first coat of wood filler. You will need at least 2 coats, letting dry and sanding between each coat to completely camoflage the inlay. Here are the two pieces after being painted. Not rocket science, but something simple and easily forgotten about. It's been a big funny joke, when people would come to my house, they like to see what table does Julie have in her eating area. Usually I would please them with something new. I have a problem. Actually I have 2 problems. One is that I have a very hard time making decisions on really stupid things and two is that I think I have to try to make everything myself. I can not tell you how many tables I have had in this little nook. Before I built the seating bench, it was a round high top, but the kids kept beating up my walls with the back of the chairs, so I changed it to a rectangular top made out of a door. Cute, but still not right. After I had built the benches I must have had 4-5 other tables, but the "need" to make one myself was still lingering. I had seen the idea a long time ago, of making a base out of pipes, and had stashed it away in the back of my little head to use when I was to make a new computer desk down the road. I loved the industrial look of it and wanted to mix it into the softer, more feminine decor around the house. I was TRYING to refinish a table that just ended up not being worth refinishing and most of it needed to be trashed. The leaves stored inside/under the table were in decent shape, and they happened to be the right dimensions for my nook. Here are a few close up and underneath pictures to give you an idea of the pieces of pipe I used and how it was put together. I jotted down a picture and list of what I thought I would need and how I wanted it constructed, then headed to Lowe's. Once piece of advice, DO NOT BRING KIDS ALONG ON THIS TRIP!! I was there in the plumbing isle for a long time and got a little greasy while trying to puzzle things together. I ended up figuring out that it was going to be cheaper to have one 8' piece cut down into 4 sections for the bottom legs of the base, so if your trying to budget this, check out all of your options. This did not end up exactly being a "cheap" project. I was surprised to spend about $75 on all the plumbing, but it was worth it! And I did have to have my husband really tighten the pipes with the wrench when he got home. I bit of adjusting, tightening or loosening, might have to happen to make sure everything is balanced and level. As you can see I attached my 4 planks to 2 other pieces of wood scraped from the old table (screwing underneath) and made sure to have them set the right space apart, so they would evenly and perfectly sit on top and of the plates, brackets, or whatever they are called that the table is resting on, then screwing into place. The wood on top had simply been sanded down. I really liked how it looked as is and didn't want to add any shine, so no stain or poly, but put a few top coats of Johnson's Paste Wax to seal and protect it and give just a little luster... Can't believe I just used the word "luster". Even if you don't have any old wood laying around, of course the classic old door with a piece of glass on top would look super cool. But you could always buy some new wood from the hardware store, more expensive oak or even cheaper pine would work great. But keep in mind that they would take stain differently. I would do a little sample before you go to town. These boards come in different widths and can cut down to length. Maybe beat it up or bit, or not, and throw on some stain! I finally tackled a project that I have been putting off for a few months. I have been so busy painting lately but I really have to focus on my empty living room that needs serious attention! I picked up these chairs a while back. They were very sturdy, cool shape to them and I thought they would be a good first time re upholstery project. I have recovered dining chairs and benches before, but nothing other than that. For some reason I only took a before picture of one of the chairs, they are identical, but on brown and other cream. After removing everything, including 8 million staples, I wanted to reuse what I could and the cushions were in great shape still. I also needed to use the old pieces as templates for cutting out the new fabric. I didn't really have anything other than a screw driver and pliers to remove staples. After stabbing myself a few times and scratching the chair up a bit, I got them all out! Seriously, you have to be careful! Work DOWN with the tools and not UP onto the finished wood. Thank goodness I was planning on painting these chairs so I could patch it up. I was so glad a took a few before pictures because the chair sat for 2 months in this stage! I got sidetracked....By the time I decides to finish the project I completely forgot what they looked like put together and referred to my before pictures to remind me. I decided on a silvery, metal type of finish for the chairs to go with this pretty fabric I had purchased. I painted the chairs with Rustoleum paint in Aluminum and did a combo of a few acrylics for the glaze. I used equal amounts of each glaze, plus a LITTLE water and rubbed on with old t-shirt. Afterwards I sprayed on 2 coats of satin poly. Then I started putting the chair back together. Next came the back of the chair, the part you lean against. Here I wanted to put buttons the back of the chair again, to make it look a bit more elegant. This fabric was SO thick. After my 3rd trip to JoAnn Fabrics that day, I finally found the only buttons that would work. They are a little bigger than I originally wanted but the only ones that would allow me to tuck all that thick fabric into back. It was nice that I could reuse the old "insides" of the chair. I knew right where to put the buttons and the holes were already in the cardboard inside. I stapled the back into place. Like all the stapling. I like to start in the center and work way to each end, pulling tight but not SOOO tight it appears unnatural. After the back, I covered the seat. The original seats where kind of in two parts and had buttons. Call me smart or lazy...I decided to make it one big fat comfy cushion. And I did not feel that the seat needed buttons, so this seat became real easy real fast! After putting the 2 layers together I added a layer of batting and stapled the fabric in place. Here is one chair almost complete. Last came the double welt cording. I can not explain how much I disliked this part. It was my first time doing a db cord and after watching a few tutorials and purchasing a zipper foot, and a third attempt, it finally worked out ok. At least now I know how to do it! Here is the finished project!! I am so happy with them!